Saint Barsanuphius the Great, who was from Egypt, and his disciple, Saint John the Prophet, struggled in very strict reclusion during the sixth century at the monastery of Abba Seridus at Gaza of Palestine, and were endowed with amazing gifts of prophecy and spiritual discernment. They are mentioned by Saint Dorotheus of Gaza, their disciple, in his writings. Many of the counsels they sent to Christians who wrote to them are preserved in the book which bears their names. Once certain of the Fathers besought Saint Barsanuphius to pray that God stay His wrath and spare the world. Saint Barsanuphius wrote back that there were "three men perfect before God," whose prayers met at the throne of God and protected the whole world; to them it had been revealed that the wrath of God would not last long. These three, he said, were "John of Rome, Elias of Corinth, and another in the diocese of Jerusalem," concealing the name of the last, since it was himself. O Great Barsanuphius and John, thou marvellous Prophet, all the hidden secrets of men and God's dispensation brightly shone in the clear mirrors of your most pure hearts; and with beams of grace divine, ye cast out sin's shadows from the souls of men; O Fathers, lights of discernment, entreat the Lord for us all. 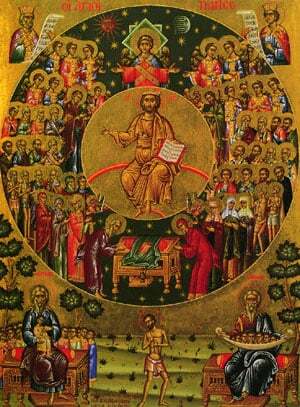 Share the feast of Barsanuphius the Great and John of Gaza with an icon greeting ecard.